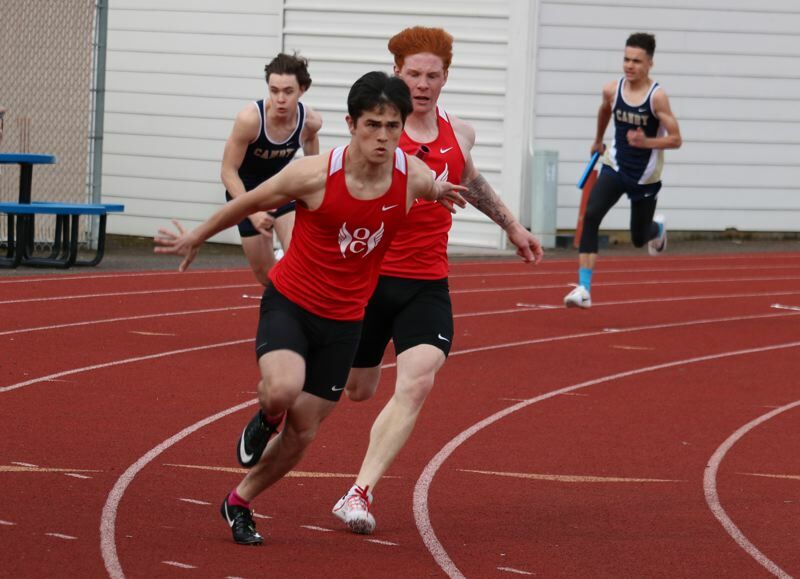 Oregon City's Josh Sanders broke cleanly from the starting blocks in the boys 4 x 100-meter relay and bolted to the lead, kicking off Wednesday's Three Rivers League track and field dual meet at Canby High School. Ricky Ascencio extended the Pioneers' lead on the back straight, Wyatt Lovell did the same on the third, and by the time Jake Follett took the baton for the anchor leg, the race had turned into a no-contest. Follett brought the relay home in a winning time of 43.90 seconds, crossing the finish line more than two seconds ahead of the Cougars. Not a bad way for the Pioneers to start in their return to the Three Rivers League. "It was OK," Follett said. Of course, there's always room for improvement, but Wednesday's performance was actually a significant improvement over what happened two weeks earlier when Lovell and Follett failed to connect inside the exchange zone in a non-conference meet with Clackamas and got disqualified. "I don't really know what the problem was," Follett said. "I think the steps were different. I may have taken off a little early and Wyatt couldn't catch me. "Today, we changed our steps and made sure we were going to get the handoff correctly. So … we got it right." Oregon City went on to place first in five of the other nine running events and in five of seven field events as the Pioneers rolled to a 94-51 victory over the Cougars. On the girls side, Oregon City's Lily Bartel won the 400 and was second in the 200, Kailee Walker won the discus and was second in the shot put, and Grace Leasure won the high jump, but the Pioneers fell short in their double-dual with Canby and St. Mary's Academy, losing by scores of 77-68 to the Cougars and 91.5-53.5 to the Blues. All of the results from Wednesday's running events were based on handheld timing, so the 43.90 that the boys short relay posted converts to an automatic time of 44.04, which not only cracked the top 10 Oregon City's all-time fastest marks, but also put the Pioneers sixth among the state's fastest 6A short relays heading into Friday's Titan Track Classic at West Salem High School. It's too early in the season to read too much into the rankings, but a 43.90/44.04 is a nice jumping off point for a short relay that hopes to challenge defending league champion Tigard and runner-up Tualatin for top honors this season. "When they get out and they hit it right, they can be a strong group," Pioneers coach Adam Thygeson said. "I think they could get into the mid-to-high 43s pretty soon. The last two exchanges were kind of iffy today, but I think they were nervous after the last meet. "It's a good group and they get along good, but we've also got other kids pushing them, and that's the best part. Josh Beck is right there, and Indy Daniel is another kid who is going to challenge. They all know, no spots are safe right now, that's for sure." One of the nice things about the current group is that three of the four sprinters were regulars on a short relay that typically had Ascencio running the lead leg with Follett second, Lovell third, and senior Israel Miles as the anchor. "I think the second leg is harder because you have to get the baton and hand it off," he said. "But on the anchor leg, you jet get the baton and go. If I'm close to someone, there's a lot of pressure because it's the last leg, but I think I can deal with that." Added Thygeson: "Jake is going to be our anchor, although we teased him about making him the lead leg because then he can't leave early. Today, I think he actually took off a little bit late, which was probably an overreaction to what happened against Clackamas. "We like Wyatt on the turn because of his 200 and 400 experience. He knows how to hit the corner well. Then we've got Ricky second just because he can kind of stretch it out a little bit more and there's a little more room to run. And Josh is our best starter in that group right now, so we're just kind of rolling with that." • Lovell won the 400 in a personal best 51.42, trimming more than half a second off his previous best of 51.96 set during the preliminaries of last season's Mt. Hood Conference championships. • Kaleb Coleman won the 110 high hurdles in 16.43, finishing more than a second ahead of teammate Hunter Comeau (17.70). Coleman then came back to win the 300 hurdles in 44.63, finishing more than three seconds ahead of Canby's Thomas Diggles (47.49). • Lane Marshall popped a throw of 50 feet, 6 inches to win the shot put and then came back with a throw of 148 feet to win the discus. • Grace Leasure won the girls high jump with a leap of 4-10 and was first in the triple jump with a personal best 34-9 1/2.